We manufacture high quality Adhesive Tapes like Self Adhesive Tapes that are efficiently used in Leather, Paper printing and Shoe industries. Available with different textures, these tapes hold fast to every type of surface. These adhesive tapes are available in different types of width, film thickness and color & design. 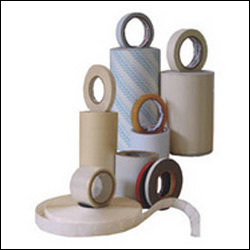 Adhesive Tapes used in Paper Mills are manufactured using high technology in order to make them water soluble for splicing, available in various grades of 'Repulpable'. Mounting adhesive tapes, manufactured by our company are used for photopolymer printing plates. They are used to increase quality of Flexo printing and reduce dot gain. These mounting adhesive tapes are available in varied size & thickness in double side and also in film based and double side foam based tapes.